(a) Install a new gasket to the water inlet with thermostat sub-assembly. (b) Install the water inlet with thermostat sub-assembly to the timing chain cover assembly with the 2 bolts and nut. (c) Engage the clamp to install the wire harness. (d) Connect the connector to the water inlet with thermostat sub-assembly. (a) Connect the No. 3 water by-pass hose to the water inlet with thermostat sub-assembly and slide the hose clip to secure it. (a) Connect the No. 4 water by-pass hose to the water inlet with thermostat sub-assembly and slide the hose clip to secure it. (a) Connect the No. 7 water by-pass hose to the water inlet with thermostat sub-assembly and slide the hose clip to secure it. (a) Connect the No. 2 radiator hose to the water inlet with thermostat sub-assembly and slide the hose clip to secure it. Connect the No. 2 radiator hose so that the paint mark on the No. 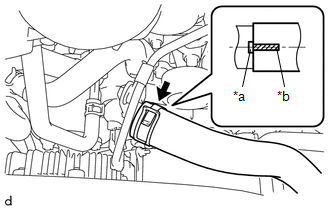 2 radiator hose is aligned with the protrusion of the water inlet with thermostat sub-assembly as shown in the illustration. (a) Install the radiator support to frame seal with the 7 clips.